The floor here is made up of mostly solid tudor floors with a stairwell opening in the NW corner. 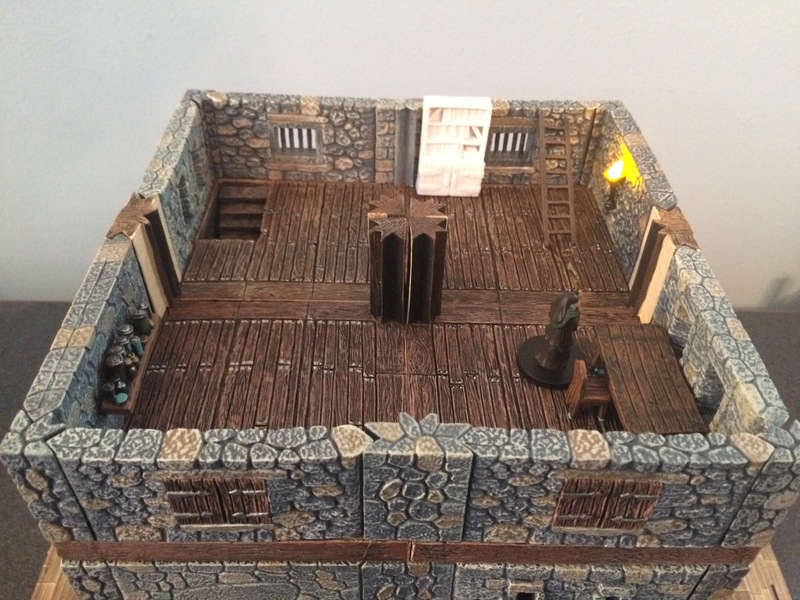 A ladder leads up to the attic, and the room is decorated with a Dwarven Forge table and chair from the Dungeons set, as well as a Reaper Bones bookshelf that I shamefully haven’t painted yet. The back walls have windows with iron bars (mostly because it was the walls I had left), the NW and SE walls are arrowslits, the south-facing walls have windows with shutters, the NE wall bears a flickering LED torch, and the SW wall is magnetic with a shelf accessory. I based the decorations partly on the description from the text, and partly on what pieces I had available and how I thought he might furnish his chambers. I let players searching the shelf to roll twice on a random common and uncommon potions table. The table, chair, and ladder, all had tiny pieces of poster tack to keep them in place during play and transport. The shuttered windows provide a place from which Elizar can deliver sermons to his followers, as well as light for when he works at his desk.